What a great week to be at camp! The fishing keeps getting better and better. Last weeks high tides combined with the just the right ammount of rain was the recipe for a wonderful week of fishing! Everybody at camp landed salmon, needless to say we had a group of very happy anglers. Salmon Lodge regular Dave Oxley with his first Grand Cascapedia salmon of 2014. If you look at the July 2013 report, he's in the same place with another fish! The rain last week gave our rivers a nice bump of water and kept them in perfect condition.The Bonaventure is at a great level and the water temperatures are perfect, especially for dry fly fishing. The Petite Cascapedia is fishing very well and we haven't missed in over a week. Fresh fish are running and most of the pools are holding good numbers of fresh salmon. The Grand Cascapedia is fishing very well however we could use a little rain to keep the present levels. So far it's been a great season at both our lodges. We are looking forward to another great week on the river. 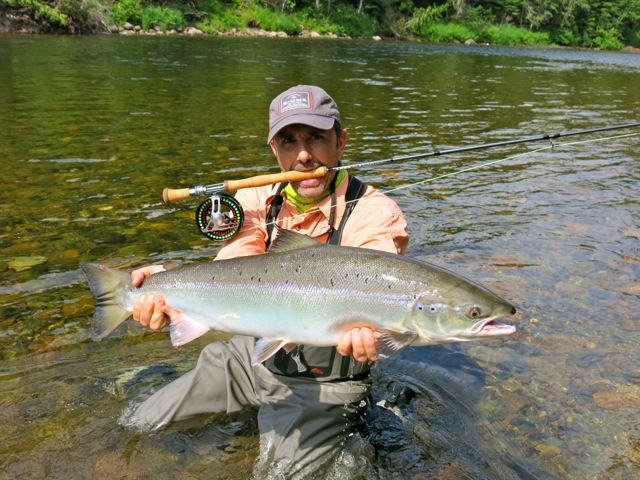 David Gaudechon holds a nice Grand Cascpapedia salmon, nice fish David! The ammunition of choice this week were bombers, especially the Green and Dark Brown patterns. Wets also did very well , the top wet fly's for the week were the Nagli and Silver Rat. The Blue Charm, Green Highlander and Undertaker did their job as well. 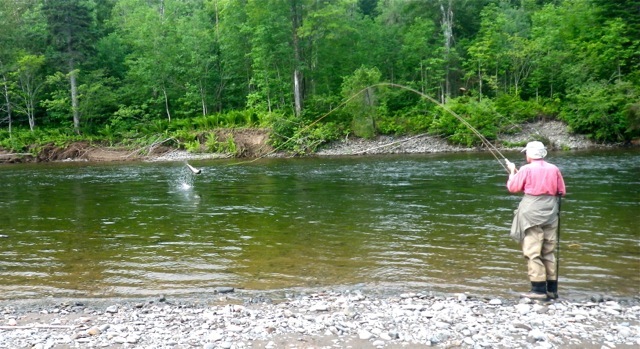 Salmon Lodge regular Jim Merritt playing a big Cascapedia Salmon, unfortunatly the fish was lost at the net. The next fish however, did make it to the net, nice salmon Jim! Don't forget to check out our photo album each week. Along with my weekly river report I post a number of the weeks salmon shots on our Photo gallery page.